Although Vitamin B17 is banned, it is not illegal! Although many of us would consider almonds to be nuts, scientifically speaking they are closer to peach pits. Almonds are actually the fruits of deciduous (meaning that the leaves fall off every year) trees originally found in Asia and North Africa. Instead of growing a sweet fleshy pulp around the seed, almonds develop a leathery coating. Beneath this shell lies a hardened pit with a dark skin, much like a pit from a freestone peach. Almonds come in two varieties, sweet and bitter. Sweet almonds are used in many Asian dishes, as well as dessert pastes and garnishes. A popular use for crushed sweet almonds is a European candy base called marzipan. The almonds are mixed with glucose (a sugar substitute that can be derived from almonds) and water to form a thick but pliable paste. Marzipan can be molded into cookies or other identifiable shapes by skilled dessert makers. Sweet almonds can also be processed into essential oils or extracts. Almond extract is commonly used as an alternative to vanilla extract in diabetic-safe recipes. Sweet almonds are often roasted and turned into slivers or chunks for texture in ice creams or puddings. The bitter form of almonds is also used in cooking, but it must first be processed in the raw stage. Bitter almonds contain a toxic amount of prussic acid, which can be further refined into a poison called cyanide. Consuming a handful of unprocessed, raw bitter almonds can lead to death from this poison. Consequently, the prussic acid must be leached out of the bitter almonds before they can be used by humans as food. The designation 'bitter almonds' does not necessarily mean a disagreeable bitterness. Extracts from bitter almonds are used to flavor a very flavorful liqueur called amaretto. The slight bitterness is a distinctive characteristic of amaretto, which is often mixed with orange juice or other sweet mixer to balance it out. Bitter almonds are also processed into slivers and whole pieces for salads and casseroles. Almond trees can be found in Asia, Europe, North America and Africa. In the United States, virtually all almonds for commercial sale are produced in California. Grocery stores may carry raw almonds for cooking, roasted almonds for snacking, ground almonds for pastes and chopped almonds for garnishes and salads. Almonds are very high in the good form of cholesterol, and are often treated with hickory-smoked salts or other savory flavors. Almonds are highly nutritious and is categorized as one of the healthiest and well-balanced food. So, before starting with almond benefits, let us take a look at almond nutrition facts. ¼ cup (around 35 grams) of whole almonds contains around 7 grams carbohydrates, 7.6 grams protein, 4.1 grams dietary fiber, 18 grams of fat, 1.7 grams sugar, zero cholesterol and amounts to 206 calories. The following table will provide with detailed information about the nutrient content in 0.25 cup almonds. The high content of oleic acid in almonds helps to fight against coronary diseases. Oleic acid, an unsaturated fatty acid reduces blood pressure. Almonds contain anti-oxidants which remove the toxic oxygen free radicals from our skin and mucous membrane. These nuts are rich in vitamin E which acts as a fat-soluble antioxidant. Vitamin E in almonds is present in the alpha-tocopherol form. 100 grams of almonds contain 25 grams of vitamin E.
Almonds contain unsaturated fats which have no cholesterol. It also aids in reducing the levels of LDL cholesterol that helps in lowering the chances of heart diseases. Lots of minerals are present in almonds which include calcium, magnesium, potassium, iron and zinc among others. Calcium, being the main mineral constituent of our body is needed for toning up muscles and bones and preventing diseases like osteoporosis. A healthy consumption of almonds everyday helps meet the daily magnesium requirement of 300mg in young women and 350mg in young men. Almonds are rich in folic acid and therefore beneficial for pregnant women, as they prevents the risk of birth defects in a baby. Folic acid also reduces the chances of cervical cancer. Almonds are a source of phytochemicals which are chemical substances obtained from plants and help keep cancer and cardiac problems at bay. Phyto-chemicals cut down on the risk of cancer and several other chronic diseases. Most of the B-complex vitamins such as riboflavin, thiamin, pantothenic acid and B-6 are obtained from these nuts. It is therefore quite obvious that almonds are a complete food. Each raw almond consists of approximately 7 calories. Here's more on calories in almonds. Raw almonds are rich in dietary fibers and proteins which play a significant role in burning the extra calories. So, if you are trying to reduce your weight, make it a habit to add almonds to your daily diet. An ounce of almond contains the following nutrients. Dry roasted almonds consist of proteins, carbohydrates, vitamins, minerals and dietary fibers as well. The following contents listed below are calculated per 100 grams. The nutritive value of roasted almonds (with salt) is 169 calories and without salt is 172 calories. Once almonds are roasted, the vitamin B content decreases otherwise the nutritive value remains the same as that of raw almonds. An ounce of sliced almonds contain 133 calories. The calorie breakdown in sliced almonds is proteins -15%, carbohydrates -15%, and fats - 81.2%. Sliced almonds are mostly for garnishing desserts. The first almond tree was planted in California, by the Franciscan Fathers from Spain, during mid 1700's. California is the world's largest producer of almonds. Old Testament of the Bible says that almonds and dates are the oldest cultivated foods. One pint of almond oil is obtained from 1000 pounds of almonds! 40% of the almonds produced are utilized in the chocolate industry. Romans believed that almonds bring good luck to a newly wedded couple. So, they blessed them with almonds. Evidently, almonds not only make for tasty snacks but are essential for good health. Whether it is hair, skin or general health, almonds play a vital role on our health. "Scientific evidence suggests but does not prove that eating 1.5 ounces per day of most nuts, such as almonds, as part of a diet low in saturated fat and cholesterol may reduce the risk of heart disease." - FDA,15th July, 2003. Almonds are nuts or seeds that are eaten raw or also included in a variety of food dishes. Almonds are also used for making almond oil, almond butter and almond syrup. Nutritionists and dietitians often advise people to consume 4-5 almonds everyday in order to have a healthy life. As they do not contain any fats, they are also safe for people on a diet. Almonds are also easily available in different forms like salted, raw, blanched, shelled, unshelled, etc. Here we will see more on the different benefits of almonds for human beings. Take a look. Sweet almond oil benefits also include treatment and prevention of dry and cracked skin. This oil is also popularly applied to baby's skin. 33% of the daily requirement of Vitamin E (which comprises a fat-soluble antioxidant) required by the body, can be made up by taking one ounce of almonds. That is the reason they are considered rich source of Vitamin E. So by inculcating just one ounce of almonds in your daily diet, you can get the essential amount of antioxidants in your body and prevent the onset of several chronic diseases. 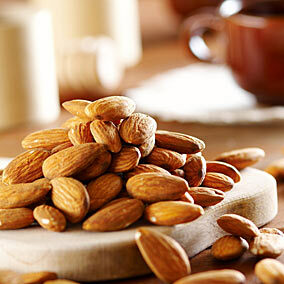 One of the most important health benefits of eating almonds is taking care of the 'bad' (LDL) cholesterol in the body. Almonds are high-fat food, but containing monounsaturated fats, which are health-promoting fats. These fats are associated with reduced risk of heart diseases. In certain studies, it was revealed that when almonds were combined with a healthy diet, the benefits were additive. One smart way for weight loss is to include almonds in your daily diet. These nuts are high in fiber and protein, and help to keep you feel fuller for a longer time. So till it is lunch or dinner time, you would not feel the need or temptation of munching on those unhealthy 'fast foods'. So, keep some of these healthy nuts at your workplace and enjoy eating them instead of any fries or cookies. Medical experts say that a diet including almonds or other nuts is less likely to cause weight gain than one without nuts. Magnesium is required by the body for undisturbed blood circulation, and improved flow of oxygen, and several nutrients throughout the body. Most cases of heart attacks are associated with a deficiency in this important mineral. So, a quarter-cup of almonds is good enough to make up for about 25% of the daily requirement of magnesium. Potassium is another substance which the body needs for keeping processes such as nerve functioning and muscle contraction running smoothly. Normal blood pressure and proper heart function is thus, dependent on an adequate quantity of this mineral. A quarter cup of almonds contain 257 mg of potassium, and it beefs up your defense against severe conditions like high blood pressure, and atherosclerosis. # Use of almond oil is well-known for treating skin problems such as wrinkles, dark circles under eyes, dry skin, black heads, pimples and others. The oil is a prime ingredient in many massage oils. It leaves the skin soft, smooth and refreshed. A face pack prepared by the mixture of almond oil, honey and lemon juice does great for the skin, when applied once a week. Apart from skin, treating hair problems is also an important benefit of eating almonds. Hair-fall, dandruff, graying and dryness can be all addressed to by daily massages using almond oil. # These nuts are rich in what is known as nutrientriboflavin and phenylalanine. These two substances improve neurological function. In other words, almonds boost brain power, and that is why it is the most beneficial for growing children. # Almonds being high in folic acid, is also immensely beneficial for expecting mothers and their newborn babies. Folic acid is essential in preventing any kind of abnormalities in infants. # One of the major almond milk health benefits is that it is lactose free, making it the best alternative to cow's milk. The milk which is derived from almonds is more suitable for people who are lactose intolerant; they cannot digest the sugar found in cow's milk. The milk finds its application in almost all food recipes which has cow's milk as one of its ingredients. To add to this, almond milk is free of antibiotics and hormones, nutritionally rich, low in calories and tastes great! # Regular intake of these nuts has been studied to provide essential protection against diabetes. One of the main concerns in diabetics is the spike in blood sugar levels after meal. In a certain study, doctors fed a group of people a meal consisting largely of almonds, and a meal with ordinary food. After testing their blood samples before and after the meals, they were convinced that the almond meal actually helped in slowing down the rise in blood sugar. It also increased the levels of antioxidants in the blood, which is again a beneficial factor against cholesterol. # The occurrence of gallstones can also be prevented by eating almonds. A mere 1 ounce of these nuts each week means 25% less risk of developing this condition. Small quantities of almonds usually fit well into most diets, but eating too many can cause side effects. Understanding the risks helps you appropriately plan your diet and avoid pitfalls. Eating too much of these nuts can trigger weight gain, cause medicine interactions, vitamin E overdose, and may lead to gastrointestinal problems. So, as recommended by experts, simply munch on 15 - 20 almonds a day and you can add more to your healthy life and happy smile! Eating a large quantity of almonds can trigger weight gain. The recommended serving of almonds stands at 1 oz. because these nuts are high in calories and fat -- 163 calories and 14 g of fat per ounce. You gain a pound if you consume 3,500 calories above what you burn, so adding just 500 calories to your diet each day for a week can make you gain weight. If you consume approximately 3 oz. of almonds each day without accounting for them in your meal plan, you can gain 1 lb. in a week. Even though the fat in almonds is primarily healthy fats, eating 3 oz. of almonds introduces 42 g of fat into your diet. Limit your fat consumption to 20 to 35 percent of your daily calories, or 44 to 78 g if you follow a 2,000-calorie diet, to avoid weight gain. Almonds are quite high in manganese. Each 1 oz. serving provides you with 0.6 mg of this mineral. Under normal circumstances, this is a good thing -- you need 1.8 to 2.3 mg per day to help your body function properly. If you consume a lot of almonds, particularly on top of a manganese-rich diet, this might trigger drug interactions. High quantities of manganese in your blood can interfere with some antipsychotic drugs, as well as antacids, laxatives, blood pressure medications and certain antibiotics. Including almonds in your diet provides you with vitamin E, which offers antioxidant protection. You get 7.4 mg of vitamin E per ounce of nuts, roughly half the amount you need each day. It takes a lot of almonds to rise above the tolerable upper limit of 1,000 mg per day, but it is possible, especially if you eat a diet rich in vitamin E foods, such as eggs, fortified cereals, spinach and whole grains. Too much vitamin E in your body can trigger an overdose situation, causing lethargy, blurred vision, headaches, diarrhea and flatulence. One ounce of almonds contains 3.5 g of fiber, an amount that contributes to the quantity you need each day -- 25 to 38 g -- to prevent diarrhea and constipation. However, eating too many almonds can actually cause constipation and abdominal bloating if your body is not used to processing large amounts of fiber. If you consume a lot of almonds, drink water along with them to help your body handle the fiber intake. Some say bitter almonds are unsafe to consume since it contains a poisonous chemical called hydrocyanic acid (HCN). Serious side effects can occur such as slowing of the nervous system, breathing problems, and death. Others say it's safe to consume bitter almonds and some even use it as a natural treatment for cancer. According to the modern F.D.A., bitter almonds are poisonous. However, it's also a fact that they contain the cancer destroying vitamin B17. Funny how that works. Bitter almonds had been eaten by humanity unimpaired during the previous 6,000 years of history. People who warn us about bitter almonds typically state that they contain prussic acid (a chemical precursor to cyanide compounds), and hydrocyanic acid (also in the cyanide family). Similar compounds exist in benign organic forms in most of our healthiest foods, so while it is true that bitter almonds contain these compounds (like other healthy foods), is it also equally true that our science does not understand how these organic forms operate inside the body. The danger of bitter almonds is generally assumed based on the discovery of these compounds, and not on empirical evidence of people actually falling dead from almond poisoning. Real science does not present assumptions as facts. Supplements of vitamin B17 for the prevention and cure of various kinds of cancer are virtually impossible to purchase in some nations, such as the United States, where the Food and Drug Administration (FDA) has made it illegal to sell them (but not illegal to own or use). The use of laetrile to prevent and cure cancer has been vehemently rejected by the FDA, the American Medical Association and the American Cancer Society. They have even labeled belief in the nutrient as a cure for cancer as medical fraud. Many people disagree, however, with such rejection of the use of vitamin B17 in the treatment of cancer. The consumption of laetrile by cancer patients proved to be effective in greatly reducing and even completely halting the growth of tumors in their body. High levels of injectable laetrile are known to help alleviate the pain associated with cancer. The anti-cancer properties of vitamin B17 cannot be denied. Many U.S. citizens view the ban on the sale of these supplements as restricting their right to alternative medical treatments. In 2007, bitter almonds (not regular almonds) were becoming popular with alternative medicine due to their vitamin B17 content. The reason for the exploding popularity of vitamin B17, and thereby bitter almonds, was due to the fact that vitamin B17 has dramatic and amazing cancer killing properties. While alternative medicine has had effective and non-toxic cancer cures since the 1930's, the new vitamin really looked like a the cure. There were reports everywhere of cancers being killed merely from patients eating heaping servings of bitter almonds daily. Soon there would be almond extract capsules, so that these same patients would need only to take one cheap, non-toxic pill per day. However, in September of 2007, the F.D.A. claimed that raw almonds had been linked to two salmonella outbreaks in five years, and that all almonds needed to be pasteurized. These salmonella outbreaks were not due to any organic almonds, which reminds us of the many meat recalls. Salmonella and e-coli are present in our foods only because of grossly unhygienic factory conditions; not because any natural foods are inherently covered with bacteria. For the organic bitter almonds, the required pasteurization would bring only one significant change in them. It would neutralize the vitamin B17. Raw almonds are the only easily accessible source of vitamin B17. They are partially illegal now by F.D.A. decree. The highest source of B17, the bitter almond tree, was banned from the U.S. In 1995. So since September 1, 2007, raw untreated California almonds have technically not been available in the United States. Despite floods of phone calls and letters of disapproval to the U.S.D.A. and the F.D.A., almonds sold in the U.S. must now be pasteurized. These same agencies have notified food producers that they may freely and dishonestly label their pasteurized almonds as "raw". Controversially, California almonds labeled as "raw" are required to be steam-pasteurized or chemically treated with propylene oxide. This does not apply to imported almonds, or to almonds sold from the grower directly to the consumer in small quantities. Nor is the treatment required for raw almonds sold as exports to countries outside of North America. Most almonds are pasteurized with Propylene oxide. Propylene oxide is a known carcinogen, and it is on California's Proposition 65 list of chemicals known to cause both cancer and reproductive harm. This means that the majority of almonds sold in the U.S. are not only nutritionally neutralized, but contain dangerous chemical toxins as well. Remember that before the F.D.A. decided most almonds must be tainted to make them healthy, almonds were so healthful that they could quickly cure cancer without side effects in many test subjects. Some food companies only sells almonds which have been pasteurized with steam, which is an improvement over poisonous pasteurization methods; but it still degrades the nutritional value of almonds, and of course, eliminates all of the anti-cancer vitamin B17. There is usually no way to know which method has been used for pasteurization, because labeling laws are made to benefit the manufacturers, and deceive the consumers. One of the biggest brainteasers about the last four years of almond regulation is that growers from the U.S. can ship unpasteurized almonds outside of the U.S. without any need to gas or steam them (these are the two processes of pasteurization) as long as they're clearly labeled "Unpasteurized." If actions always speak louder than words, then we can assume one of two things from this. First is we don't care about the health of the other countries that buy almonds – assuming almonds are truly a danger to society, we'd be running the risk of contaminating foreign almond consumers with salmonella or cyanide poison. Or, second, we can conclude that almonds really aren't contaminated (or that poisonous?) – and the industry knows the two cases above were just isolated cases. Any business owner in their right mind (or even in their wrong mind), does not want to have a contaminated product. It's bad for business – let alone the people who purchase it, even if they are overseas. If almonds were the issue, and were really a threat to human health, then all almonds that are sold in the U.S. would have to be pasteurized. But here's the thing. Really raw almonds can be sold in the U.S. by retail outlets – as long as they're not grown in the U.S.
You can buy unpasteurized, raw almonds from Italy at your local store (be prepared to pay!) and no one seems to care if they've been regulated or not. Farmers in California can also sell unpasteurized almonds direct to the consumer. This means, simply by action, that almonds are – again – not the issue or the reason this legislature was passed and continues to be enforced. If any hospital uses laetrile, the law says that they jeopardize any grants from the government as well as any monies from Medicaid and other hospital insurance originating from the government. Since nearly all of hospital revenues come from patient insurance, not one hospital in the U.S. will take the chance and use any banned substance including, Amygdalin (also called vitamin B17 and Laetrile). Any doctor that wants to use the substance from apricot pits (richest source of vitamin B17), must have their patient fill out a form, and then the doctor must submit the form to the FDA. Again, doctors don't want to get involved in this and would rather keep their names off of the FDA lists. Additionally, the doctor's malpractice insurance will not be valid if they prescribe laetrile (B17--amygdalin) to a patient. The American Medical Association (AMA) treats any doctor that prescribes laetrile to have violated the AMA's membership policies and may be subject to membership termination. In addition, doctors are officially forbidden from using or even discussing B17 unless a patient mentions the subject first. Therefore, any doctor that prescribes laetrile may destroy his career as a doctor. Any individual that sells laetrile must not claim that it does anything in his place of business, and especially in regards to curing cancer. Making health claims about vitamin B17 is illegal and may send you to jail. Many health food stores in the past were raided and had to give up their supplies of B17 because the B17 was near books that claimed that the B17 was the answer to cancer. In other words the books were near the B17 in the stores and was therefore considered "labeling" which is a term used by the FDA. Labeling according to the FDA is against the law and can be prosecuted. However, on the Internet, it is different. Internet law is tricky and not the same as U.S. commercial law. In one case, a person took the FDA to court and won his B17 back. That court case proved it wasn't wrong for him to have or to sell it.